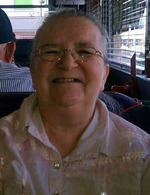 Cheryl Elaine Love Smith, age 63, of Phoenix, Arizona formerly of Woodsfield, Ohio died Monday March 12, 2012 at the Chris Ridge Premier Care and Rehabilitation Center. She was born in Marietta, Ohio September 11, 1948 a daughter of the Carolyn Highman Love of Woodsfield and the late Robert Love. Cheryl enjoyed singing more than anything. She belonged to her senior citizens center choir group which won several 1st. place awards. Her favorite video game was Wii bowling. She was part of a group called reminisce which was a group that met once a week and talked about old times and what they did in their lives growing up. She enjoyed visiting with family and friends and talking about what was going on in each other’s lives. Cheryl enjoyed being a mother and grandmother and talked about her children and grandchildren to anyone who would listen. Preceded in death by her father; Robert E. Love Sr., her husband; James R. Smith Sr., her grandson; Christian Star Willman, and her mother-in-law; Mary Louise Smith. In addition to her mother; Carolyn Love, Cheryl is survived by her three children; Fayetta L. Willman, Sherry J. Smith, and James R. Smith Jr., three grandchildren; Andrew Smith, Courtney Smith, and Gillian Willman, one sister; Kay Williams, and two brothers; Bob Love and David Love. Friends will be received from 12 noon until time of Funeral Service at 2 p.m. Saturday March 17, 2012 at the Bauer-Turner Funeral Home 100 S. Paul St. Woodsfield, Ohio with Minister Keith Jones officiating. Interment in Oaklawn Cemetery Woodsfield.